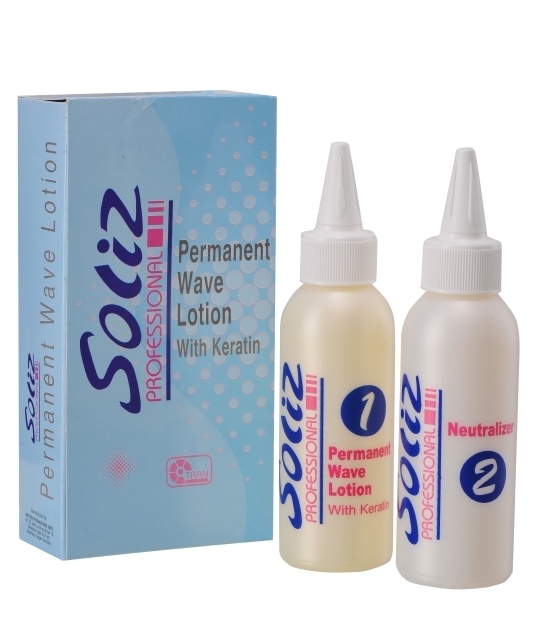 Soliz Hair Professional Permanent Wave Lotion with Keratin is formulated to maximise the natural condition of hair during waving and insure moisture and structural reaction to smoother and protect hair & scalps. The special Soliz Hair Professional Permanent Wave Lotion with Keratin benefit in helping hair retain structure, lustre texture thus you retain more lusting, uniform curls. 1) Apply shampoo gently but thoroughly, do not massage scalp, towel dry. 2) Select proper rods. For softer more casual-body curls, use thick rods. For curlier styles, use thin rods. 3) Apply lotion to one curl at a time and wind onto rods without tension. 4) After entire head is wound, remoister each curl with lotion. 5) Test curls every 2 or 3 minutes until the desired pattern is obtained. 6) DO NOT OVER PROCESS. 7) As soon as desired curl is developed, rinse with warm water. Towel dry the excessive moisture to assure that Neutralizer can be absorbed. 8) Apply Neutralizer to each individual curl evenly. Curls should be saturated at least twice. 9) Leave Neutralizer on for 5-10 minutes. Then remove rods and rinse with warm water. 10) The hair is ready to set style.